Are you familiar with the name, Somenoya, a tofu company specializing in selling fine quality tofu by way of roaming sales in cars mainly in the Kanto region. The tofu company has a long history dating back to its establishment in 1862, during the Edo period. 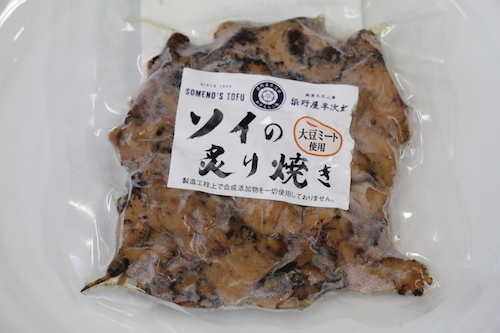 Somenoya makes their tofu with 100% domestic soybeans and 100% natural seawater nigari (a thickening agent) without the use of chemical and artificial additives such as defoaming agents. Heat sterilization is commonly conducted to increase shelf life, but this is not done at Somenoya for the purpose of maintaining the flavor and sweetness of the soybeans. The scrupulousness to pursue the culinary satisfaction in the products is clearly evident. 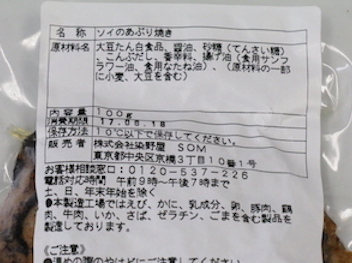 We recently received news that Somenoya began selling a healthy soybean based processed food, the Soy Meat. And rumor has it that it is exquisitely delicious. 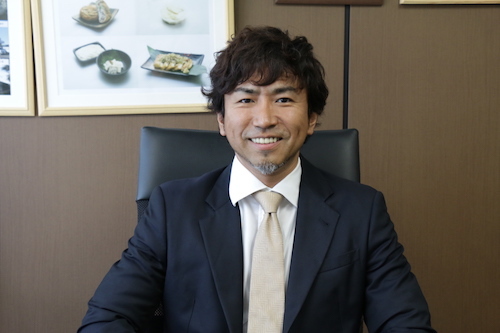 We went ahead to Somenoya’s Tokyo head office and met with the CEO, Atsuto Ono, who inherited the title of Someya Hanjiro VIII. The main objective of the interview is to witness this Broiled Soy, pictured above. This frozen packet is ready to eat in just three minutes after heating it in hot water. The roasted surface looks just like real pieces of meat – it can fool anyone. Let’s take them out of the package and set them on a plate. The toasty aroma of soy sauce is very appetizing. Please excuse the lack of vocabulary, but there’s just no other way to express it. All three of the Vegewel staff (one vegan and two non-vegetarians) that were present at the time of the interview had the exact same reaction. One of the cons of soy meat is that it tends to have a distinct aroma peculiar to soy. While soy meat is healthy and good for the body, we can’t deny that this particular odor turns many people away from enjoying the soy meat. However, this Broiled Soy is practically odorless when it comes to that particular smell. Moreover, the texture of the soy meat is undoubtedly different from the conventional soy meat. The texture of the soy meat is created to resemble the meaty fibers, and it looks like real chicken meat. The soy meat has a robust soy sauce flavor, and it would go very well with a side of rice. half of the people will believe the dish to be an authentic yakitori bowl! We had the soy meat with a little bit of soy sauce and wasabi, and we’re certain that a glass of beer will pair well with it. As you can see, the ingredients are free from artificial additives and very healthy! The Broiled Soy is not yet available in supermarkets for now, so be sure to check out the Somenoya website for details. Now we present you with the interview with the CEO, Mr. Ono, who invented the Broiled Soy. -We hear you follow a vegan diet. What made you do so? -Did you notice any changes after you began leading a meat-less lifestyle? -What is the future for soy meat products? “Japanese vegetarian cuisine is strongly perceived as being very mild in taste. That is why we seasoned the Broiled Soy with a full flavor – a taste you can enjoy with a healthy serving of rice. We’ve created the yakitori-type this time, but we’d like to provide a wider variety of soy meat products in the future. -Do you plan to expand abroad? so much so that we were requested to export the products before even showing the finished product. -One last message for all of us, please! “Animal husbandry is said to put a heavy burden on the environment. Substituting a portion of your daily meat consumption with soy products will have a positive effect on the environment. -Thank you very much for your time today!